Princess Margrethe was studying in London at the London School of Economics in 1965 when she met her someday Prince, French Diplomat, Count Henri de Laborde de Monpezat. (After their marriage, ‘Henri’ was changed to the Danish version of the name ‘Henrik.’) The pair met at a dinner, however, it is rumored that the Count had hesitations about the dinner after finding out HRH would be in attendance, fearing she would be boring… But for some reason or another, the Count did attend the dinner and was pleasantly surprised to find the Princess not a bore. A few weeks after their first meeting, of which the (now) Queen has no special recollections, they chatted quite a bit at a wedding they were guests of and slowly began to hit it off. They were able to keep the relationship and subsequent engagement low profile while the Princess was not well-known in Britain, and the Danes were unknowing of the affair. 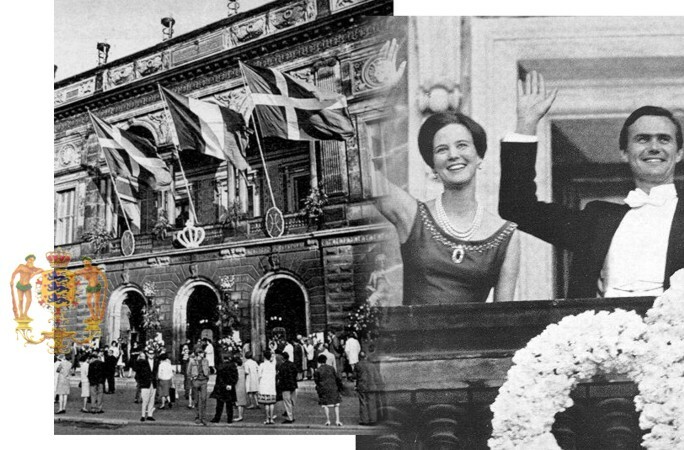 On October 5, 1966, King Frederik IX asked the State Council for the consent of his daughter’s marriage to the Count. The country of Denmark celebrated the announcement, and the Princess and her husband-to-be waved eagerly from the balcony of Amalienborg Palace. 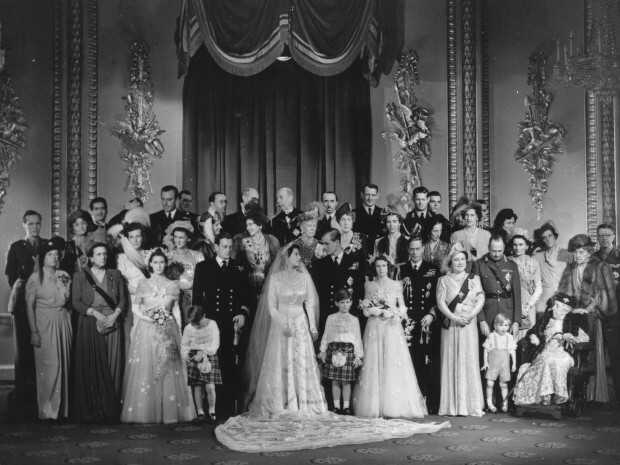 Though the ‘official’ celebrations aren’t said to have begun until May 30, 1967, the events surrounding the wedding began on the 25th when the Count arrived from France. A Royal Family reception was held and pupils from a school performed. However, it wasn’t until the Count’s family arrived on the 30th when the party truly began, firstly with a Gala Banquet for the Diplomatic Corps. The next day, the Royal couple attended a special performance by the Royal Theatre of Copenhagen in honor of the marriage. The King and Queen lent the Royal box to the pair, and the rest of the seats were sold as though it were a normal performance. 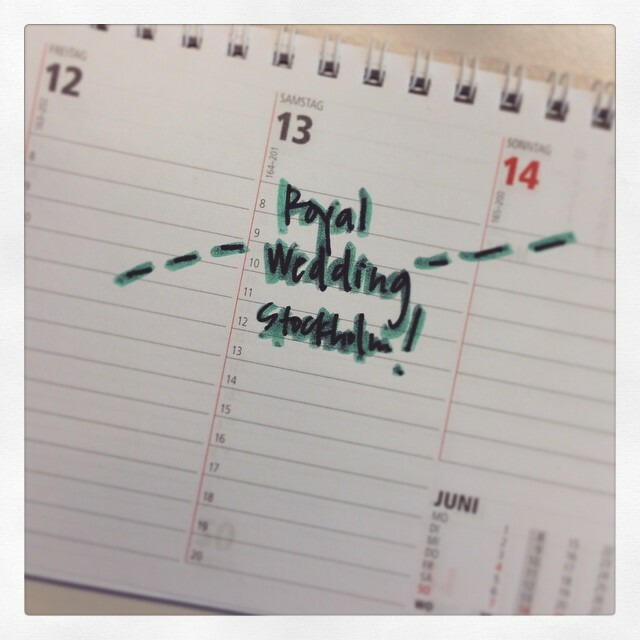 The 1st of June was spent preparing for the big day. In the evening the Government and Parliament Banquet was held at Christiansborg Palace. 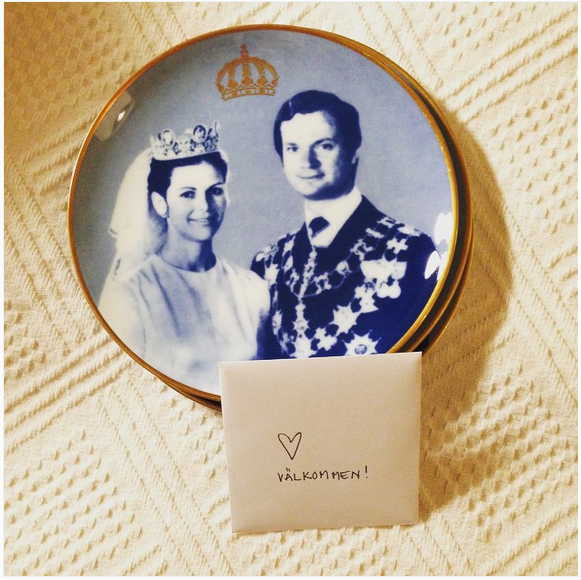 It was on June 3rd that the Princess’s sister, Princess Benedikte, celebrated her own engagement with her family. June 5th, the Danish National Day, brought with it a cloud of somberness while conflict broke out in the Middle East. The Royal Council gathered in discussion of what to do and decided that life goes on, and they should continue with the Royal festivities. They went ahead with the gala at Fredensborg on the 6th. June 7th the Princess and the Count attended the French Embassy’s Gala Banquet, followed by a reception and ball. The Princess’s grandfather, the King of Sweden, arrived on June 8th, and an informal dinner was held for all the incoming guests to meet and mingle at Fredensborg Palace. June 9th brought with it reduced tensions in the Middle East, as well as a reception for the Royal couple at Copenhagen City Hall. 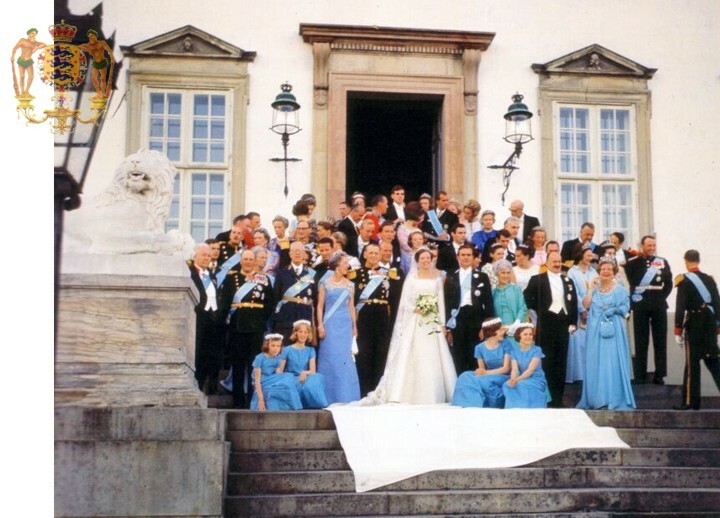 On June 10, 1967, Royals from all over Europe were in Copenhagen to attend the marriage of Princess Margrethe to Count Henri de Laborde de Monpezat at Holmens Kirke. 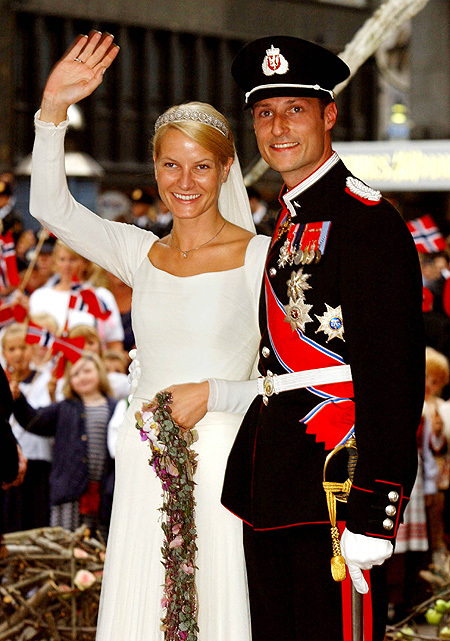 The Princess’s dress was designed by Danish designer–favorite of Queen Ingrid and courtier–Jørgen Bender. The dress was designed to include both traditionally regal details, as well as having details that showed the Princess’s love of art and her creativity. Along with the gowns elegant square neckline, beautiful silk fabric, and long, 15-foot train, and lace passed down from the Princess’s grandmother, Crown Princess Margaret of Sweden, the gown featured a daisy brooch. 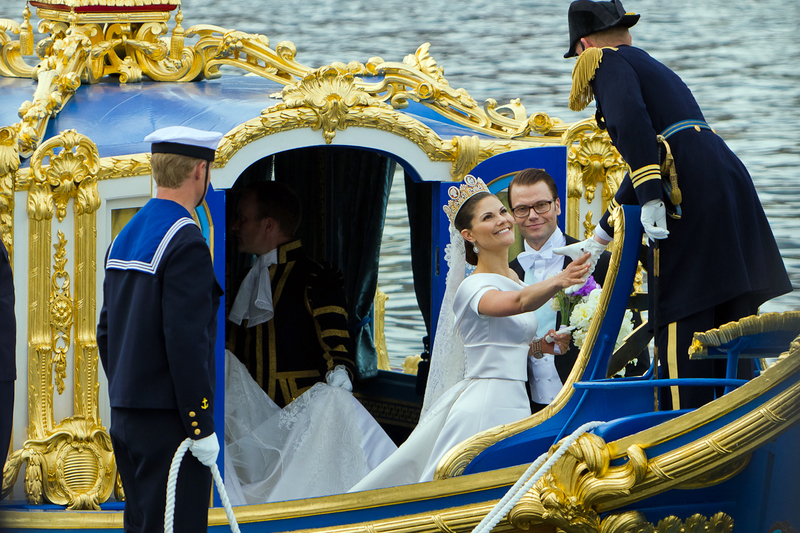 Crown Princess Victoria was 25 years old when she first began training with personal fitness instructor Daniel Westling, her someday Prince. She had recently moved back from the United States where she had been studying at Yale and was receiving professional help with her battle with anorexia. CP Victoria remained incredibly private during her courtship with Westling, so unfortunately not much is known. However, news broke of the relationship after a photo was snapped of the two kissing at one of CP Victoria’s friend’s 25th birthday party. Though her father, King Carl XVI Gustav, was vehemently against the relationship, after much ‘prince’s school,‘ the relationship was approved. Daniel reportedly proposed on the grounds of Drottningholm Palace on a beautiful day. She, of course, said yes and the official announcement was February 24, 2009. 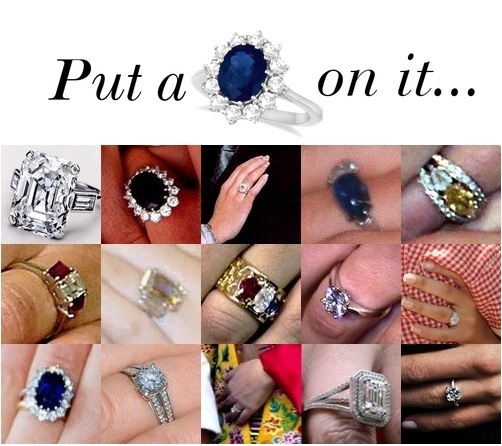 It was considered the ‘biggest royal event‘ since the marriage of Prince Charles and Princess Diana nearly 20 years before. 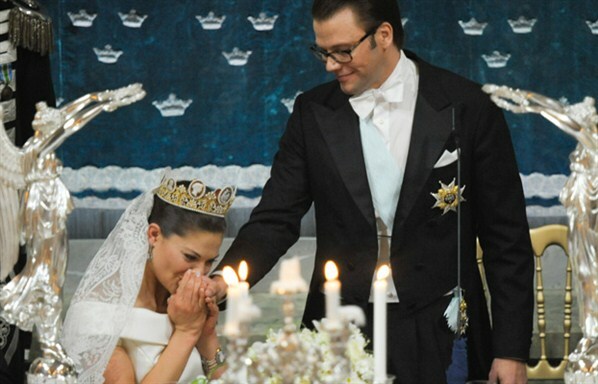 More than 1000 dignitaries from around the world attended the event, and more than 250,000 people lined the streets of Stockholm to celebrate the wedding, which took place on June 19, 2010, the 34th anniversary of CP Victoria’s parents. CP Victoria’s gown was made of ivory silk and was designed by Par Engsheden. Her tiara, the Cameo tiara, is more than 100 years old, as was her veil. This is one of my top three favorite Royal Weddings. 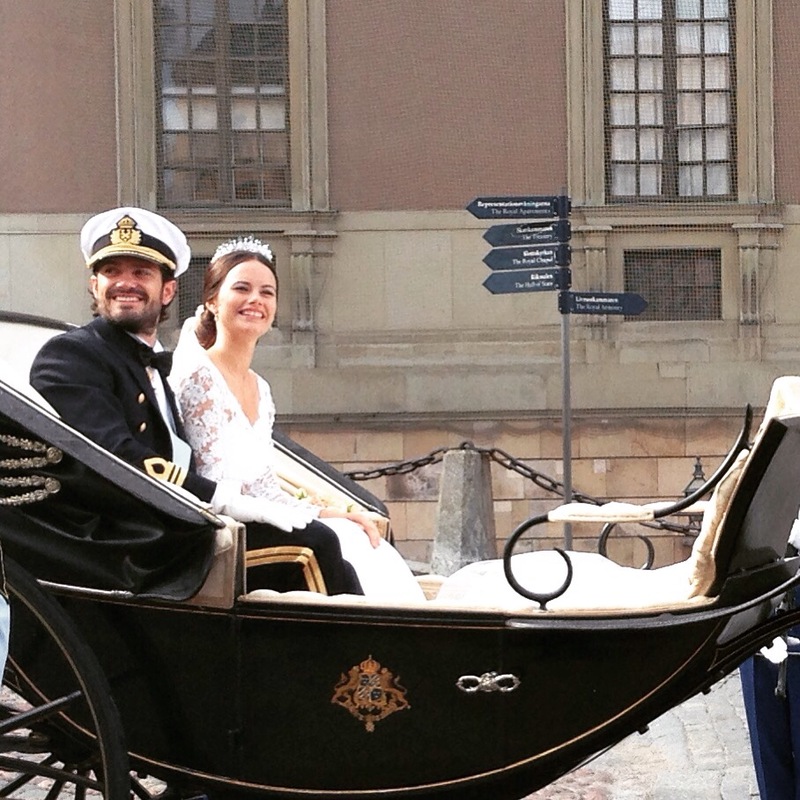 Crown Princess Victoria looked so beautiful and she and Daniel’s love was radiating. A very young Princess Elizabeth, age 13, met her someday prince over a game of croquet. On request of her father, King George VI, a young cadet at the college they were visiting was put in charge of entertaining the young princesses for the day. The 18-year-old cadet, who also happened to be a prince in his own right, is said to have captured the young princess’s love that day, and has kept it ever since. “I also noticed that she began to play her gramophone more than usual, and that her favourite tune was People Will Say We’re In Love, from the musical Oklahoma! — which she’d seen with Philip. 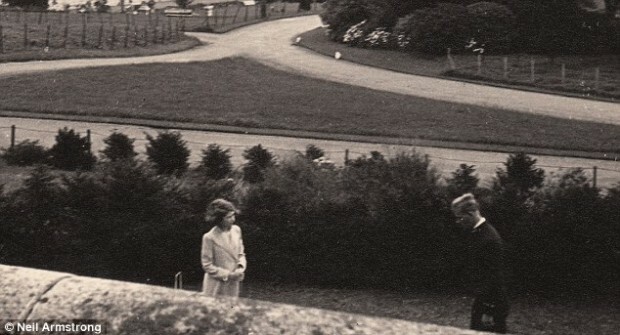 Prince Philip is said to have proposed during a walk with Princess Elizabeth through the Balmoral grounds. It was initially a “secret engagement.” Although it’s reported that many were hesitant of the marriage, especially the King, it was a short engagement. The official announcement of the engagement was on July 7, 1946. Having suffered the ravages of WWII, the celebration was a welcome, though thought-out event. 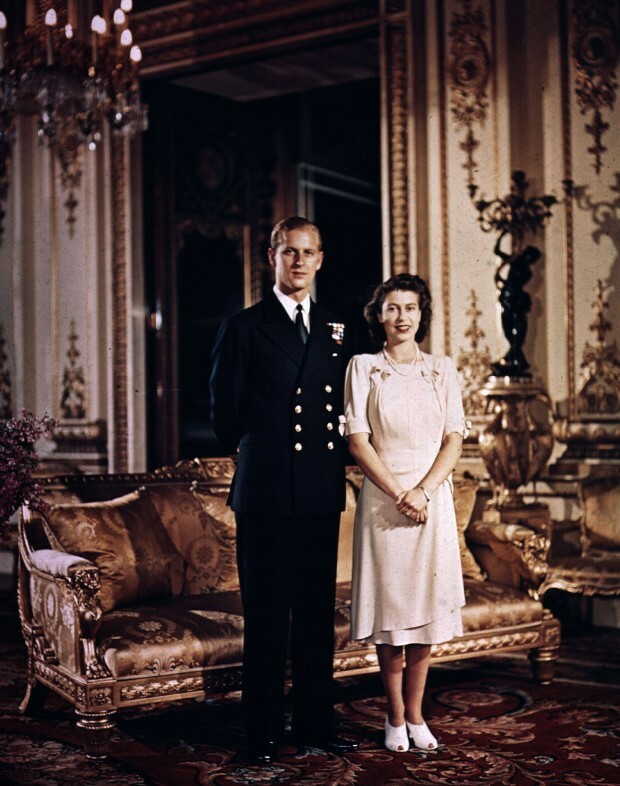 Winston Churchill described it as “a flash of colour on the hard road we have to travel.” Rations were used in creating Princess Elizabeth’s gown, which included a short train, and decorated with 10,000 seed pearls. 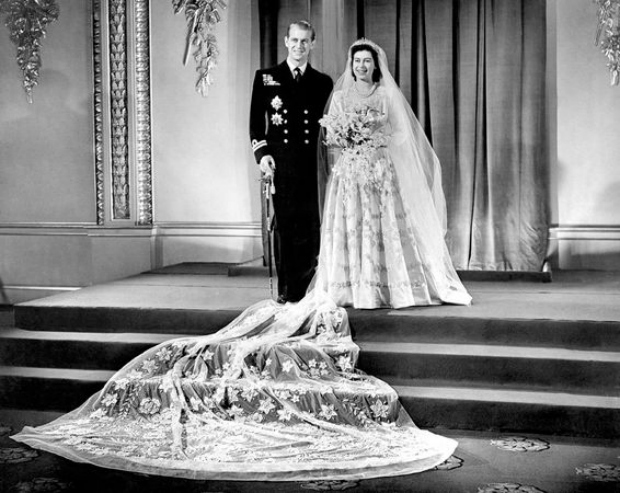 (Fashion-Era) The wedding was the morning of November 20, 1947 at Westminster Abbey. More than 2000 guests were in attendance with more than 200 million people listening worldwide. 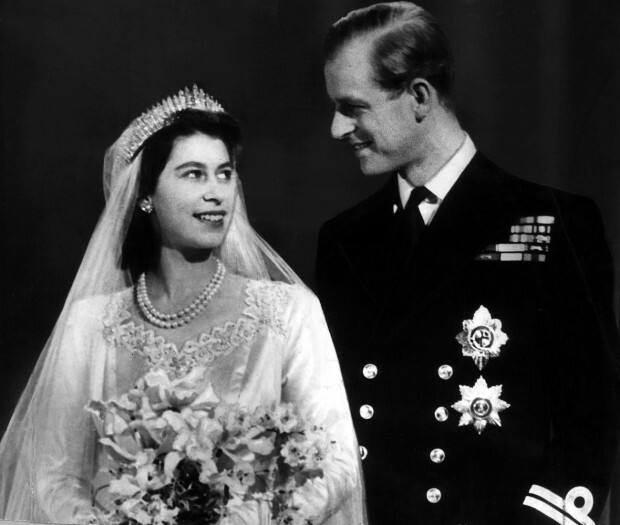 After 60 plus years together, the first British monarch to celebrate a diamond wedding anniversary, as well as Prince Philip being the longest living consort, their love has to be true to make it thus far. And you have to admit, the way he looks at her, and she him, it’s pretty apparent it’s love.